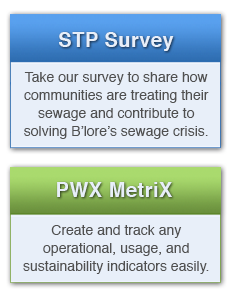 PWX is the WASH sector's platform - to select, fund, manage, monitor, and assess impact of water, sanitation, and sewage projects. A scalable exchange with mobile tools, PWX is the only participatory decision-making system where empowered peers help each other succeed. PWX combines people, process, and technology to increase efficiency, accountability, and collaboration enabling the WASH sector to make a verifiable dent in the global water, sanitation, and sewage crises. PWX addresses the challenge of scale! By dividing up the work and increasing the number of expert resources at very low cost, PWX can manage thousands of small-scale projects for the long-term: from funding to impact. PWX helps competitors become collaborators; as they work together, learn, and share, we create the impact we desire. Field tools like SMS and mobile phones combine with PWX MetriX and PWX AnalytiX - the first set of business intelligence tools in WASH - enable effortless tracking of projects, portfolios, and impact. Work & Network - Mapped! See all proposals, projects, and members on the water sector's first and still leading interactive map. Summary Maps of PWX members, activity, and funding. After installing users can login and download their project portfolio before going to the field. In the field, the app will help locate projects and create field notes. Take photos, verify project operation and impact on the ground and share instantly - or when you get back online (many rural WASH projects are still out of network)!